Tailgating for Buckeye football games is practically a sport in itself. Here’s what you need to know for game day. First, know where to go. The Horseshoe is, of course, the prime tailgating spot (season parking permits only) and revelers can be found enjoying picnic lunches and cold (or hot, depending on the game!) beverages up until kickoff. The Fawcett Center on Olentangy River Road near Lane Avenue is another popular spot that has public parking. For details on parking, click here. Need some gear? Stop in The Buckeye Corner on Lane Avenue. Before heading into the game (or watching from one of the campus favorites like Eddie George’s Grille 27), stop by St. John Arena for the Skull Session, OSU’s pep rally, which begins two hours and 15 minutes before kickoff of every home game. 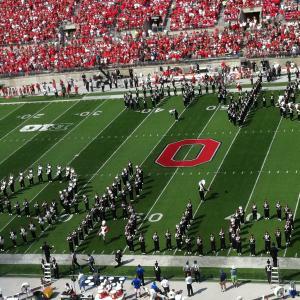 The Ohio State marching band gets fans in the spirit with “Hang on Sloopy” and more. 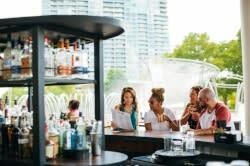 For a traditional (albeit a bit raucous) tailgate experience, head to the Varsity Club on Lane Avenue. It’s been a Buckeye must-go since it opened in 1959, and fans will arrive well before kickoff and stay until the wee hours.